February 2016 – The Rich get Richer and the Poor…? March 2016 – The Rich get Richer and the Poor…? January 2015 – How do Carrier Contracts Impact Shortage of Lease Operators? March 2014 – Two Weeks Notice! November 2014 – To Lease or to Own? August 2013 – Making Payments on your 2012 Income Tax? May 2012 – The best way to pay taxes, or NOT pay taxes. May 2011 – Fuel Costs for Owner Operators? December 2008 – December is the Time for Wrapping Things Up! 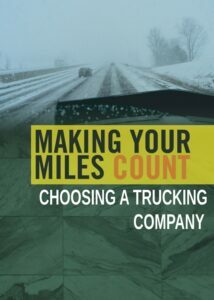 February 2011 – Choosing A Trucking Company Shortest Route!